Dundee opened his eyes. "What was that noise? Oh! Hee hee. It was only me snoring. Well, since I’m awake, I might as well go outside and see what the weather’s like." The bear left the cave and strolled through the woods. "I see it’s a wee bit foggy today. Ah, but it’s a grand day." He took a deep breath. "I can smell the loch." He felt his tummy rumbling. "Come to think of it, a fat trout sounds rather delicious." The water lapped against the muddy banks of the loch. Dundee pushed bracken and fern out of the way as he made his way down to the shore. A castle stood on an island in the middle of the loch. He could barely make out its shape through the highland mist. Nobody had lived in the abandoned castle for many years. "Is that a light I see in the window? It almost looks like someone’s got a candle going in there." The bear squinted. "I can’t see a thing in all this fog." He put his toe into the water. "Och, that’s freezing. I’m not going to swim over there." Dundee scratched his head, trying to think of why a light was in the castle. "What if it’s a ghost? Castles have ghosts, especially old castles like this one." "Who are you talking to?" "Who said that?" Dundee asked. He looked around but couldn’t see a thing. "It’s me, Harry. Down here, by your feet," the mouse squeaked. "Harry? What brings you out on a day like this?" "I was feeling a wee bit hungry. Do you always talk to yourself?" Harry giggled. Dundee felt embarrassed. Trying to change the subject he said, "Do you see the light in the castle window?" "Yes. That’s odd though. Nobody lives there any more," Harry answered. "I think it’s a ghost." "A ghost?" Harry looked carefully at the castle. "It’s hard to tell with all this mist. I’ve got an idea. There’s a strip of land that leads to the castle. We could walk over there and peek in the window." "Do you think we should? What if it is a ghost?" Dundee asked. "There’s only one way to find out. Follow me." Harry ran through the ferns. Dundee followed. "Here it is. Here’s the strip of land. It’s not too wide but you can do it." "The water’s cold, Harry. It doesn’t look that safe either," the bear complained. "I think you’re afraid of the ghost. Come on. Follow me." Harry ran toward the castle. When they reached the door, Dundee pushed it open. "It’s upstairs." Harry climbed the stairs as fast as his tiny legs allowed. They’d reached the top of the stone steps when suddenly bagpipes began to play. "SCREECH! BLARE! SCREECH!" The two of them stopped. "Bagpipes? A ghost that plays the bagpipes?" Dundee gulped. "I don’t like this one bit, Harry. Let’s just leave." Harry didn’t reply. He ran into the room. There stood a ghost, gazing out the window. It was dressed in a tartan kilt and was blowing into the bagpipes. "Yikes!" Harry squealed. "It is a ghost!" A candle sat on the table. It was flickering as the cold wind blew through the castle’s halls. The first thing Harry and Dundee noticed was that the ghost was a bear, just like Dundee. The ghost turned around. "And who might you two be?" he asked. "I’m Harry. This is Dundee." "What are you doing in my castle?" the ghost enquired. "We saw the light in the window and wondered who was in here. Who are you?" Harry questioned. "My name’s Roderick McBear. I was born in this castle, as were my ancestors before me." "You look just like Dundee," Harry said. Dundee and the ghost looked at each other. "That’s because I’m his great grandfather. After I was killed in battle, the other McBears fled into the woods. I have stayed here since, guarding what is rightfully mine." "My great grandfather? You?" Dundee asked. "Why haven’t we seen or heard you before now?" Harry wondered. "I’ve been staying down in the dungeon. For some reason tonight I felt the urge to come up to the top and play my bagpipes. Now that Dundee is here, he can take over guarding the castle and I can travel on," the ghost said. "Me? I can’t play the bagpipes," Dundee laughed. "Aye, you can. Here, try," the ghost said, handing them to Dundee. 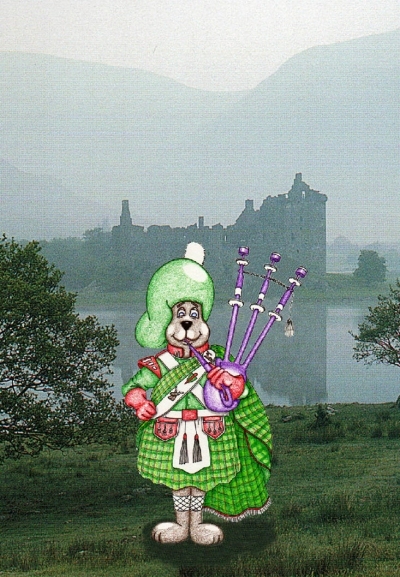 The bear put the bagpipes to his mouth and began to blow. "SCREECH! BLARE! SCREECH!" "You can play them," Harry chuckled. "Take my kilt and my shoes and guard the castle. You’re a McBear! It’s your job now," Roderick said and then vanished. Every night from then on, Dundee stayed in the castle. Sometimes Harry brought other woodland animals over to the island and they’d have a ceilidh. Dundee was happy that he didn’t have to live in a cave any more and he was proud to be a McBear!